Before the age of mechanical refrigeration, households would keep their meats and vegetables cool in an icebox. The icebox got its name from the block of ice that was housed in a compartment locate at the top. The ice would slowly melt into a tray underneath that would need to be empty on a regular interval. The ice was delivered to your house by an iceman who would visit a couple of times a week. The blocks of ice came from people who would go out onto frozen lakes and rivers and cut block of ice as shown in this picture. 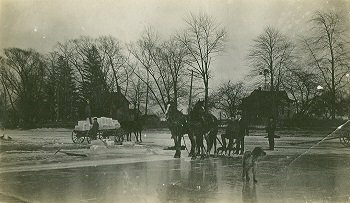 This picture, showing men cutting ice on the Detroit River, was taken in the early 1900s. The blocks of ice would then be taken to an ice house for storage, where it was covered in hay and saw dust to provide insulation to provide for ice year around to area homes and business. This type of activity lasted until the 1950s when mechanical refrigerators became a household accessory. If you would like to view additional historic photographs of Windsor, please visit the library’s digital exhibit “Windsor’s, History and Pictures“. My father and uncle remembered the iceman in the 1920s. They and other children would gather the bits of ice that would fall from the cart and eat them! Yes I do remember the ice blocks .I was very young at the time & my grandma had an ice box in her kitchen .The ice man would deliver her ice block to which grandma would put it in her cool ice box. I got a lot of laughs every time I would visit her. Those days sure bring back some wonderful memories of my childhood. Thank you for posting it.